Age brackets for Youth Lacrosse are established by US Lacrosse and are based on a player's age as of August 31 of the summer prior to play. These guidelines have been adopted by High Sierra Lacrosse League (HSLL) for use in the Truckee/Tahoe/Reno region. Whereas more densely populated regions, where lacrosse is well-established, often breakdown their age brackets to the single year level, HSLL combines two age brackets to form one. For example, the 7U and 8U brackets are rolled together into a single 8U bracket, meaning all players were 8 years of age or "under" as of August 31 of the prior summer. For the 14U bracket, HSLL typically allows any 8th grader who has not yet played lacrosse at the High School level. 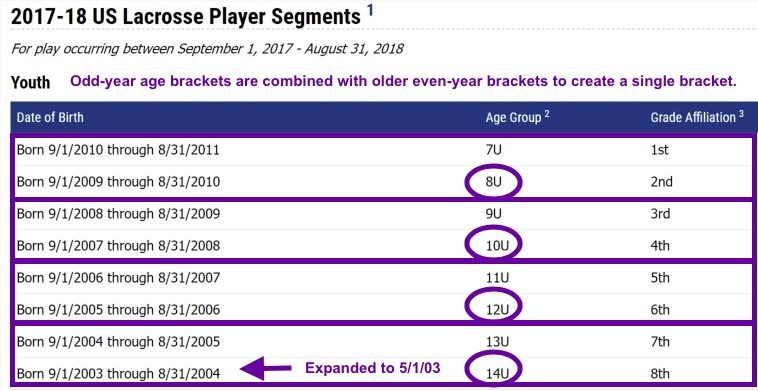 If a player had a birthday slightly before the August 31 cut-off and is therefore put into an age bracket ahead of his/her peers, an exception is sometimes made to allow that player to "play down" one age bracket. A petition must be filed with HSLL before that can take place.